This Pinup Photo was added on Wednesday 23 November, 2016. 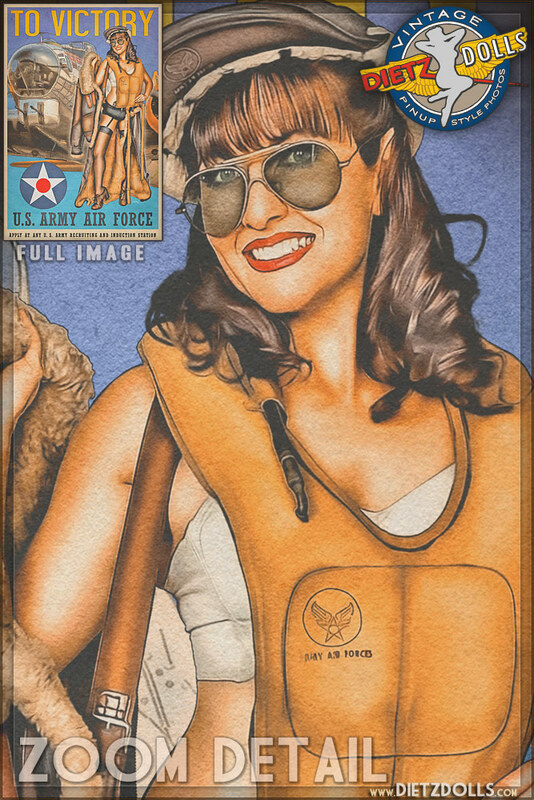 Another in the Airbrushed Propaganda Pinup Poster series featuring Shauna in this call to join the U.S. Army Air Force! The Army Air Corps (USAAC) was founded in 1926 having been renamed from the US Air Service during World War 1. In the early 30s the Army Air Corps had about 1,600 aircraft in inventory with very early monoplane fighters. By 1941 with the threat of war on the horizon, that number had grown to over 6,000 aircraft. The AAC name lasted through the peacetime between the wars and into the attack on Pearl Harbor in 1941. It wasn't until March of 1942 that the Army Air Corps was renamed to the Army Air Forces and became a fully structured arm of the US Army not only providing ground support but also independent operations. Notify me of updates to To Victory!